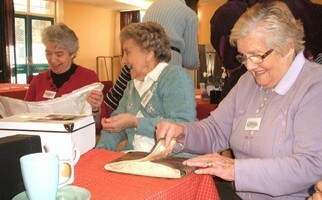 Thanks to a grant from the Wyrde Croft Wind Farm Community Fund the Museum of Technology can now offer Reminiscence Sessions in the newly furnished Community Room. 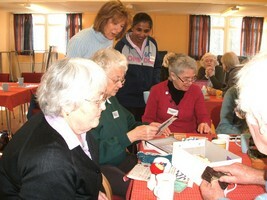 Groups of up to 10 people from Care Homes and Dementia Groups are invited to use the resources on offer. The session will be led by qualified leader. The museum has three boxes containing objects that can be used as memory prompts. Our boxes contain a collection of replica and genuine artefacts, documents and pictures; everything is designed for respectful handling. The charge is �3.00 per person; this includes tea/coffee and biscuits. 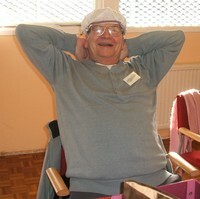 Reminiscence therapy is a powerful way of helping empower people with dementia by accessing long-term memories. It can bring pleasure, stimulation and meaning, and has the potential to lift depression and improve communication. 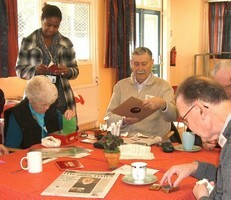 For any information regarding the Reminiscence Sessions Contact Rosie or phone 01945 700772. "At Home" includes a 78rpm record, Dolly Pegs, Old Money, Sewing and Mending, a Knitted Tea Cosy, a Button Hook, a Darning Mushroom, and lots more. 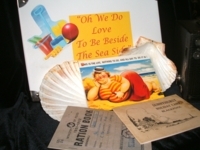 "Going Out" includes, a Day at the Sea Side, a Box of old games, Box Brownie Camera, post cards, VE Day News Paper, Ration Books and ID Cards. "Ladies Things" a Girdle, Stockings, Hair Pins, Cami Top, Silk Scarf, Ration Book, Fan, and "Mens Things" in an old OXO Tin, includes a Red Driving License, a Valve, a 10 bob note, a pound note, old pennies and threepenny pieces.